We have written previously (in Patent Spam and Other Scams, and Reminder: Unauthorised Patent Register Scams) about the various ‘unauthorised register’ scams run by unscrupulous operators seeking to rip off fairly substantial sums from International Patent (PCT) applicants in order to record application details in private, and worthless, databases. PCT applicants and agents have informed the International Bureau that some of these requests to pay fees are being sent in envelopes which appear to bear the WIPO/OMPI logo and the address of the organization. Please carefully review all such requests. The services which are being offered in these invitations do not come from WIPO. Since, as a practical matter, these scams appear to be as unstoppable as spam, phishing, and Nigerian money transfer schemes, it seems that all we can do is to join WIPO in continuing to raise and maintain awareness. If you are an applicant, beware of official-looking letters requesting payment. If you have an agent or attorney handling your applications, you should not receive any official correspondence directly (except, perhaps, the occasional notice from the European Patent Office – but not requesting money). 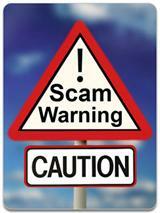 If you represent applicants, please ensure that your clients are aware of these scams. It may be useful to direct them to the WIPO warning page, which is updated regularly with new examples and information.